Sending expensive carburetor’s through the mail is risky, especially to someone you don’t know personally. Hopefully with these screenshots of online reviews from MG forums, such as The MG Experience, as well as an Ebay profile, will put some ease that we will take care of your carburetor rebuild project with respect. The MG Experience is an online MG-focused forum where MG owners ask technical questions about their car, repairs, tools, etc. 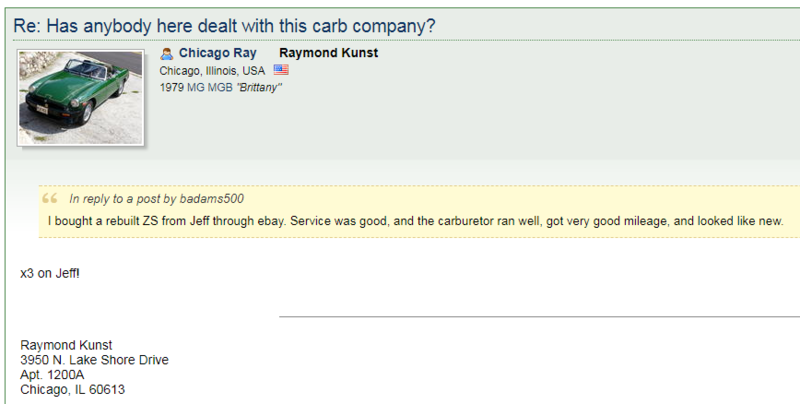 Above, a user asked the community about Paltech to see if they’re a reliable carb company. Before having a website, I sold almost exclusively on Ebay. Since 2000, I’ve been handling customers’ carburetor’s with respect and care. Please check out my Ebay profile filled with positive reviews and comments. Here are my Ebay stats, hopefully they will give you confidence that I will take care of your carbs like they were one of my own. Thank you!